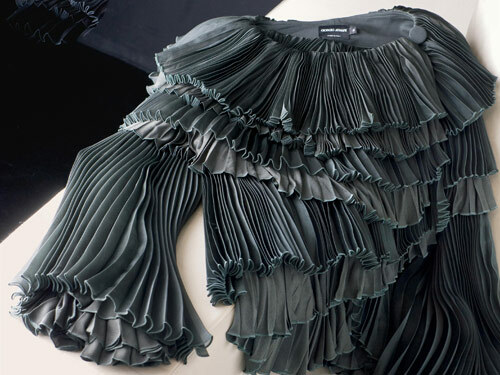 Armani's Fashion Philosophy skirt and blouse with Blush screen in Macassar ebony. 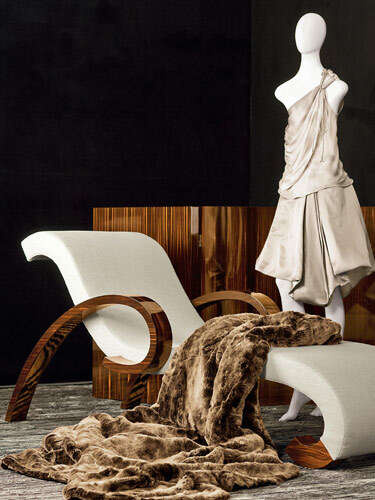 The Borromini linen chaise, Boreal rabbit throw and Burt rug exude elegance. Bold geometric patterns, shimmering black pleats and refined textures define the latest collection from legendary designer Giorgio Armani. But don't think these seasonal trends are exclusive to the fashion runway. 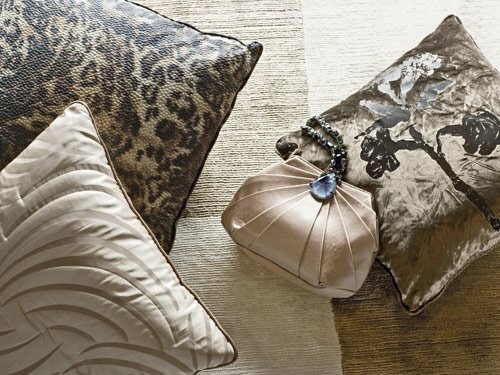 Armani was one of the first high-profile fashion figures to enter the world of home furnishings, translating a design aesthetic into a range of home products from furniture and textiles to accessories and tabletop. Launched in 2000 as a separate division within the Giorgio Armani Group, Armani/Casa embodies the Italian icon's inimitable style, bringing the same sophistication and timeless elegance of his fashion sense to his collection of understated interior decor. Armani's extension into the home is consistent with the designer's fashion philosophy and language. "The process of creating products for the home and for fashion collections is very similar," he says. "Both skills require an ability to imagine things in three dimensions and to translate sketches into reality. In both cases, it is the precision and finesse that will make all the difference." The furnishings are designed to fit specific zones in the home: living, dining, bedroom, study, kitchen and bath. Each season, additional lines are introduced to complement the existing ones. In the midst of a recession and with much fanfare, Armani recently opened his 47,000-square-foot U.S. store in midtown Manhattan, bringing all of his labels under one roof. Blending effortlessly with tailored suits and couture dresses, Armani has transcended fashion to become an all-inclusive luxury lifestyle brand. The Armani Extension is a interior design inspiration. The room suddenly becomes a trendy, Euro style to it.